Email and telephone contact information is placed on this website only to enable communication about college business. Unsolicited email is not acceptable and action will be taken against companies and individuals sending "spam" messages to college staff and students. Telephone calls may be recorded for training or monitoring purposes. To plan your journey to Dudley College of Technology, download our How to Find us Map (124kB), use the interactive map on each campus page to get directions, or use a journey planner. 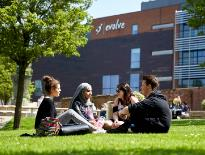 There are plenty of footpaths around Dudley College and we are close to Priory Park. Walking is a great way to get here as it keeps you fit, it’s sociable and free! Cycling is a great way to get to Dudley College and we have plenty of covered cycle shelters and all of our sites to store your bike when you get here. Dudley Bus station is situated within a 10 minute walk and provides access to bus services covering additional areas such as Halesowen, Walsall and West Bromwich.